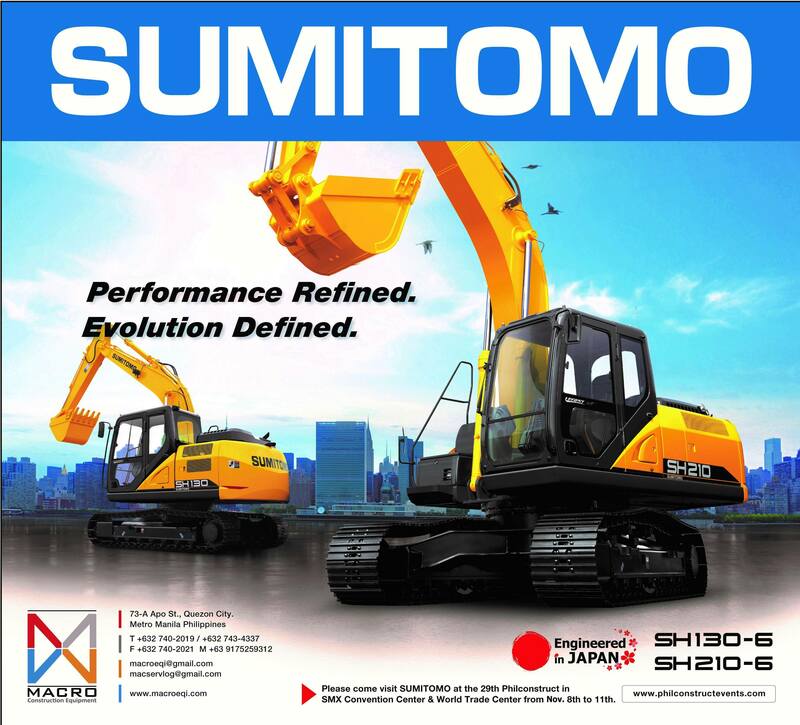 Sumitomo is bound to showcase their latest excavators at the biggest construction show in the Philippines, by having their booth with our distributor Macro Construction Equipment at Philconstruct Manila Expo 2018. The event has been showcasing products like building materials and components, construction equipment and materials, building and construction accessories, and other building essentials for over two decades. And it has become a keystone in defining the landscape of building and construction on the country. The name Sumitomo already has a 400-year history and heritage behind it. The company started developing, manufacturing, and selling construction machinery in 1964 establishing Sumitomo (S.H.I.) Construction Machinery Co., LTD. and it has been the Philippine market since the 1980s. They will be exhibiting their most fuel efficient Hydraulic Excavators, SH130-6 and SH210-6, at their booth. These models have acquired high satisfaction by customers from Japan, Indonesia, Thailand and other ASEAN countries. Sumitomo strongly believes that these models can contribute further in the infrastructure developments in the Philippines. Construction firms and contractors coming in for the event are encouraged to have a feel and look of the equipment and experience the company’s design principles, such us safety and comfort for the operators in the field. Sumitomo is also proud with the kind of performance its products can offer, featuring both speed and power while working. More importantly, each design is made with high profitability in mind. Sumitomo has the capacity to sell approximately 13,000 hydraulic extractors and 300 asphalt pavers in a year. These products are distributed in Asia, Africa, Australia, Europe, the Middle East, and North America. Here in the Philippines, Sumitomo’s hydraulic excavators are distributed by Macro Construction Equipment and asphalt pavers by Kurashiki Equipment Philippines Corporation. By having their booth at the Philconstruct 2018, Sumitomo hopes to establish the brand further in to the Philippine market — to create more connections and strengthen the existing ones. Philconstruct 2018 will be held on November 8-11 at the World Trade Center Metro Manila, where everyone can drop by the Sumitomo booth.